I fell in love with Rachel from the very beginning, from the first episode. I’m very easy to please, I know, but when she was singing ‘On My Own’ from ‘Les Misérables’, that’s when I said: ‘Oh God, this is good, I love her!’. 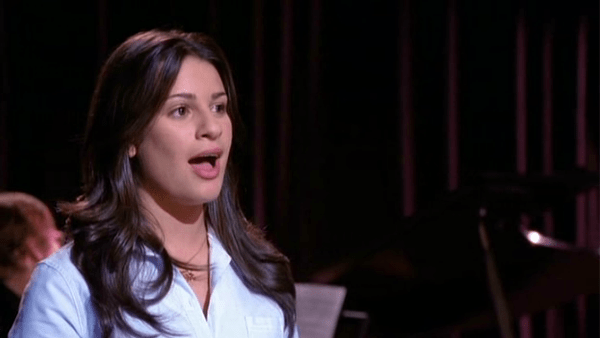 In 6 seasons, Rachel has performed three songs from ‘Les Misérables’: ‘On My Own’, ‘I Dreamed A Dream’ (as a duet with Idina Menzel) and ‘Bring Him Home’ (as a kind of duet with Chris Colfer). I’ll take a break here to say that I think that the writers made a great job with ‘I Dreamed A Dream’. The song was perfectly integrated in the story, it was performed in a very beautiful and moving way. And of course, sung by Idina Menzel and Lea Michele (who were playing a mother and her biological daughter) is the best choice ever. On the very first episode of the show, Will Schuester is looking for people to join his new project, a brand new Glee Club. He prepares the auditions and, of course, Rachel Berry, joins them. She performs ‘On My Own’, from ‘Les Misérables’. I think that it’s a good choice for some reasons. First of all, is a great song so she can show all her vocal range. And also the lyrics mean a lot to her. She is special; she is different, but also misunderstood, like Eponine. While she is performing, she explains that she wants to be a Broadway star, that’s why she always puts a star after her name. In only a few seconds of a song you know how is her. You see that she is ambitious, with great dreams and a lot of passion to be an artist. In the case of the show, the song means all the sadness that Eponine is feeling, because she loves Marius but he is in love with Cosette. But in ‘Glee’, you can understand the show like Rachel is so in love with musicals, wants to be an artist, but she is a freak, everybody ignores her. So this song is very dramatic and powerful for the show. It’s definitely a great choice. ‘Les Misérables’ is a musical created by Claude-Michel Schönberg and Alain Boublil. It’s one of the most important musicals in history, is the longest running show in London, celebrating 30 years on stage. So, of course, Rachel Berry and most of the characters of ‘Glee’ admire this show, because they love musicals and this one is important. There are thousands of performances of ‘On My Own’, you can have a look online. My favourite ones are Lea Salonga’s, Samantha Barks’ and Carrie Hope Fletcher’s version. But Lea does an amazing job too, is a good song for her that means a lot for the fans of the TV show and the musical. Esta entrada se publicó en Glee y está etiquetada con Alain Boublil, Claude-Michel Schönberg, Glee, Lea Michele, Les Misérables, Rachel Berry en 18/05/2015 por cesarmp90. Happy Birthday ‘Les Misérables’ and ‘The Phantom of the Opera’! October is a celebration month for all musical lovers. It’s the anniversary of the longest-running shows in London. ‘Les Misérables’ celebrates 29 years of performances and ‘The Phantom of the Opera’ 28. Next year, the show created by Claude-Michel Schönberg and Alain Boublil is going to celebrate 30 years, is a lot of time for a musical. Will it be a special performance? I hope so! ‘Les Misérables’ opened on 8th October 1985 at the Barbican Arts Centre, in London. But on 4th December 1985 it was transferred to the Palace Theatre, where it stayed until 3rd April 2004, when it moved to Queen’s Theatre (its actual home). The original production included Colm Wilkinson as Jean Valjean and Patti LuPone as Fantine. Since then, the show has just grown up, beginning one of the classical musicals ever. In 2012 it was adapted in cinemas. It’s a show that all musical lovers can’t miss. It’s a great show, I was completely amazed when I saw it for the first time in Barcelona in 2011 (there’s been several Spanish productions). This year, I saw it again in the Queen’s Theatre. I love absolutely everything about the musical, all the songs, the characters, the story are so moving, so touching. I hope that ‘Les Misérables’ runs in the West End for many years more. ‘The Phantom of the Opera’ started their performances on 9th October 1986 (one year after than ‘Les Mis’) in Her Majesty’s Theatre. The original production included Michael Crawford as the Phantom and Sarah Brightman as Christine. In 2005, the movie adaptation directed by Joel Schumacher was released in cinemas. I discovered this musical watching the movie, but this year I saw live in stage for the first time in Her Majesty’s Theatre. I was really surprised with the effects. I knew the story and the songs already, but watching it live was a beautiful experience. The entire atmosphere, the great actors and choreographies… Everything was wonderful. So I hope we can still see ‘The Phantom of the Opera’ for many years. From Musicals Are Great, I wish you Happy Birthday ‘Les Misérables’ and ‘The Phantom of the Opera’!!! Esta entrada se publicó en Blog, London, News y está etiquetada con Alain Boublil, Andrew Lloyd Webber, Anniversary, Classic, Claude-Michel Schönberg, Les Misérables, Stage, The Phantom of the Opera en 09/10/2014 por cesarmp90.